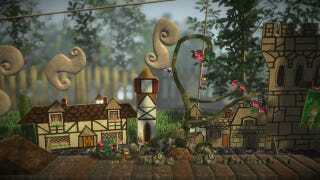 What if LittleBigPlanet Had Been Free To Play? We could have had Sackboy for free at one point. Turns out that this was an early suggestion from Sony to the fledgling group of devs that would become Media Molecule, the studio revealed at the Develop 2011 conference. "Phil said all sorts of buzzwords that hadn't really hit yet. He said it should be driven by DLC and that it should be free-to-play, have a social core and premium, paid-for content. From that initial meeting Sony agreed to fund us for six months. But that time was primarily spent making videos to try to explain what this game was going to be, not to Sony, but to ourselves!" At that time, the game was called Craftworld, and Valve had even expressed interest in hiring the team — and this was in 2005, before they had hired the Narbacular Drop team that would go on to develop Portal. I'm now imagining a world where Little Big Planet could have been free to play, Portal never happened, or maybe it did, but was developed by Media Molecule, and it was full of candy and joy. Someone should notify these guys of all the alternate realities they've potentially created by telling us this.